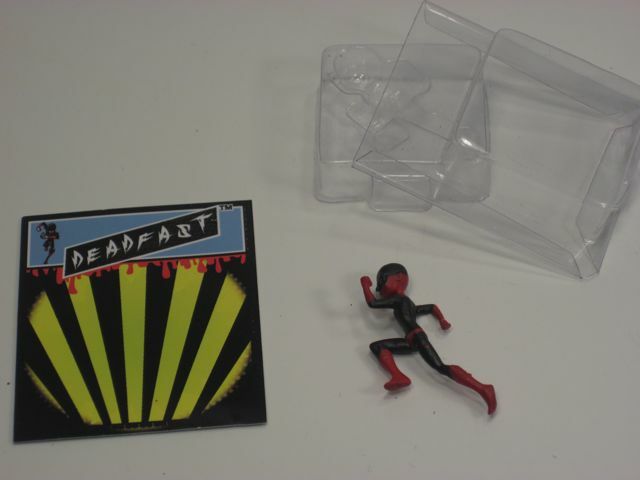 ...and she comes with this amazing little Dead Fast mini action figure. I love miniatures. 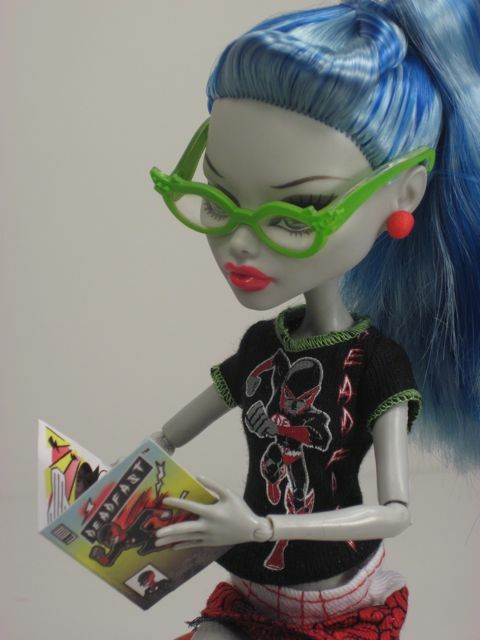 Since I don't want to de-box her, I thought maybe I could de-box another Ghoulia and put her in the "Comic Book Club" outfit (which also comes with that little action figure) and then I'd be all set. 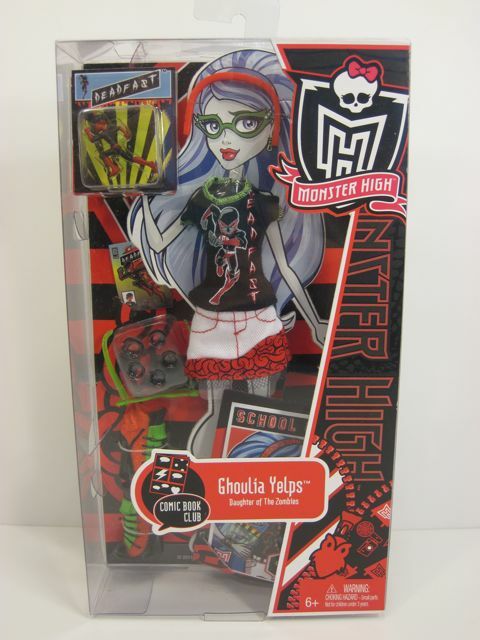 Before I de-box Ghoulia, though, let me back up a bit and talk about Monster High dolls in general. The concept behind these dolls is that they are the offspring of famous monsters. Draculaura, for example, is the daughter of Dracula. She has fangs and pink skin and just turned 1600. Deuce Gorgon (a male character) is the son of Medusa and he has green snakes for hair and shouldn't be looked at directly. 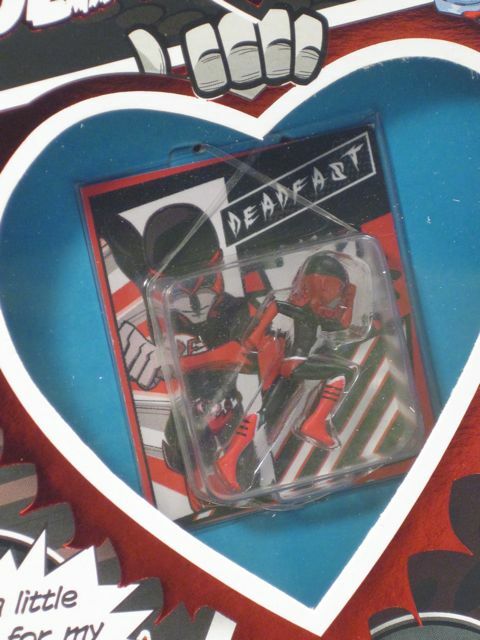 Some of the connections are more vague--like Ghoulia Yelps being the daughter of "The Zombies," and Spectra Vondergeist being the daughter of "The Ghosts." 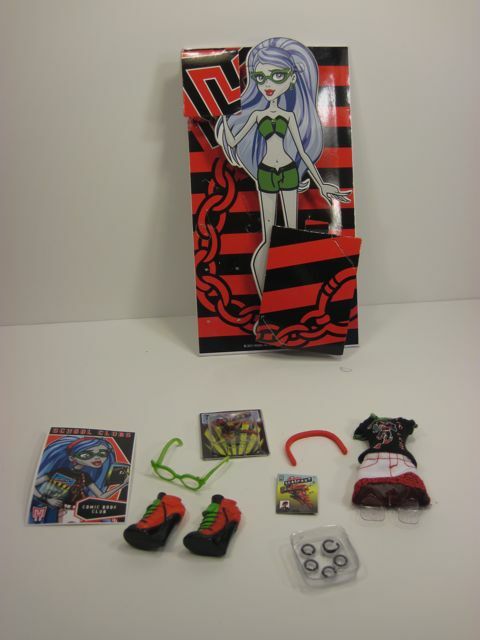 The original doll release consisted of five dolls; Draculaura, Clawdeen Wolf, Frankie Stein, Cleo De Nile and Lagoona Blue. There have been (I think) 15 new additions to the line since then, not counting the variety of Create-a-Monster characters that are possible. 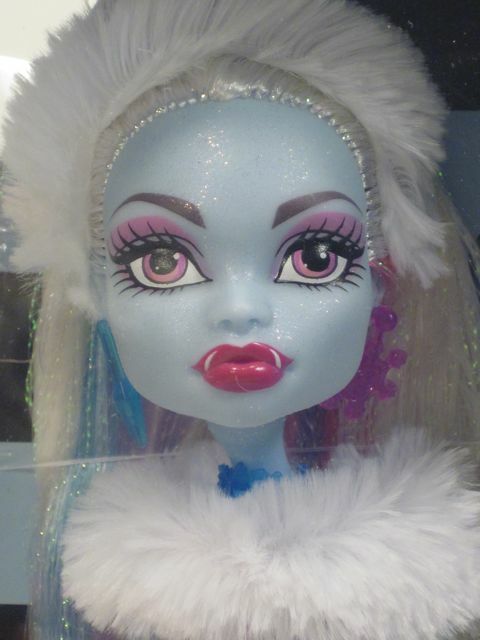 Most of the ghouls are about 16 years old, dress in flamboyant fashions and have very distinct personalities based on the Monster High TV show. 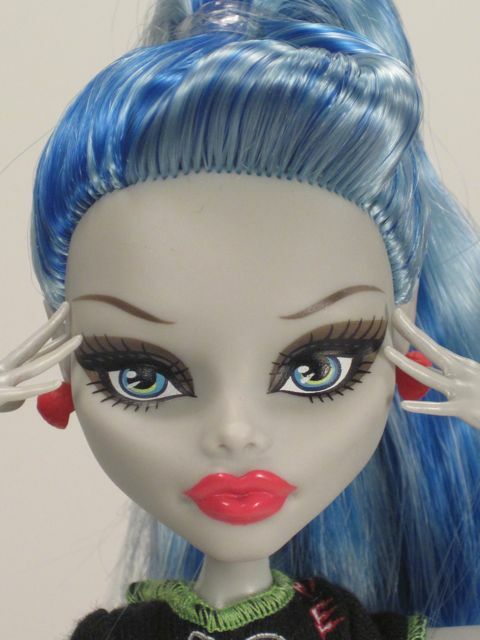 I have found these dolls for sale at Target, Walmart, Angelic Dreamz, Toys R Us, Justice, Mattel online, and I think I saw a few dolls at the Claire's at my mall. They range in price from $13-$35. 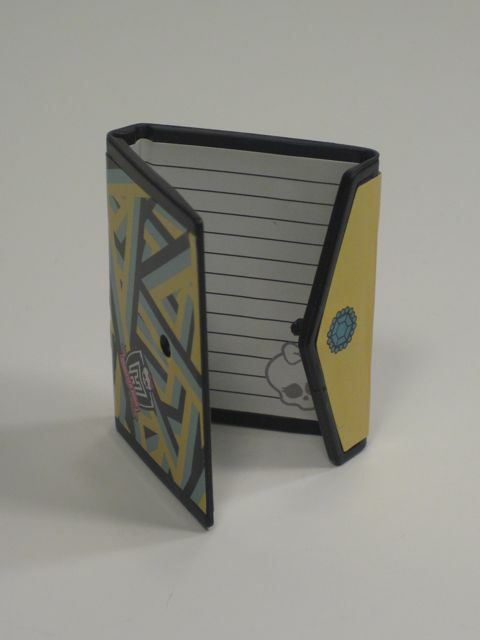 It is definitely best to buy them in person, both because of the inflated online prices and to avoid obvious defects. 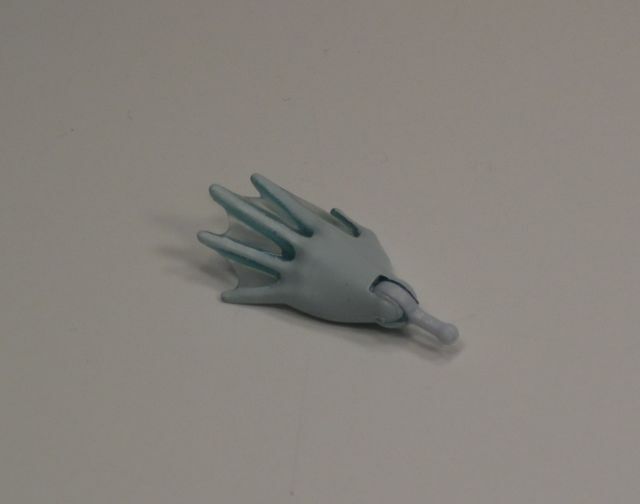 They have a fairly normal range of flexibility, slightly limited in the neck and knees, but high in the arms and hands. 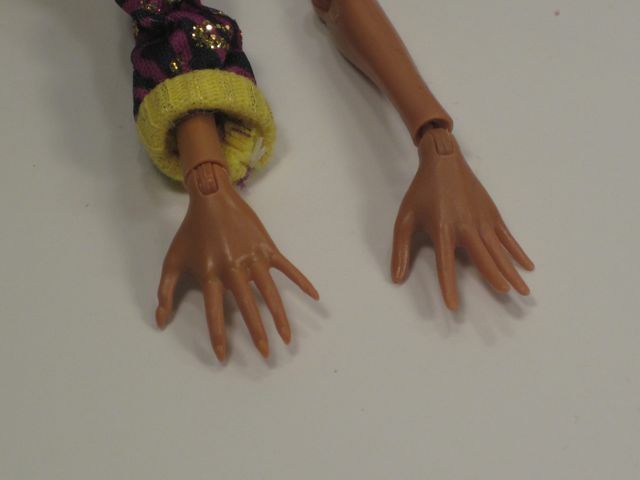 Dressing the dolls in thin-sleeved clothing with those splay-fingered hands is impossible, but the arms detach at the elbow and the hands themselves also come on and off for very easy dressing. So, those are the bare basics of these dolls. 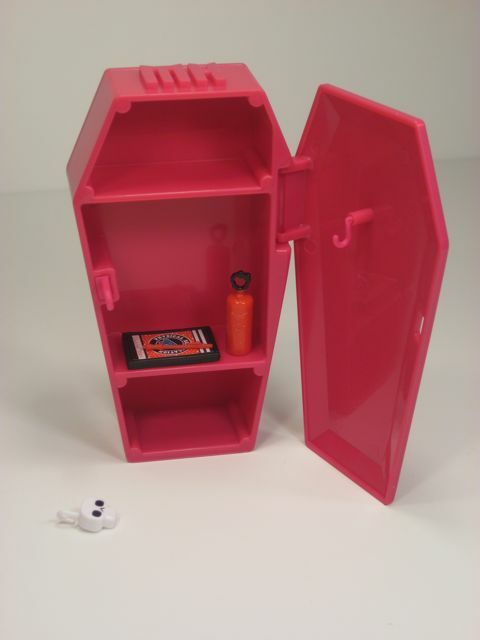 Now, let's get back to freeing Ghoulia from her box. 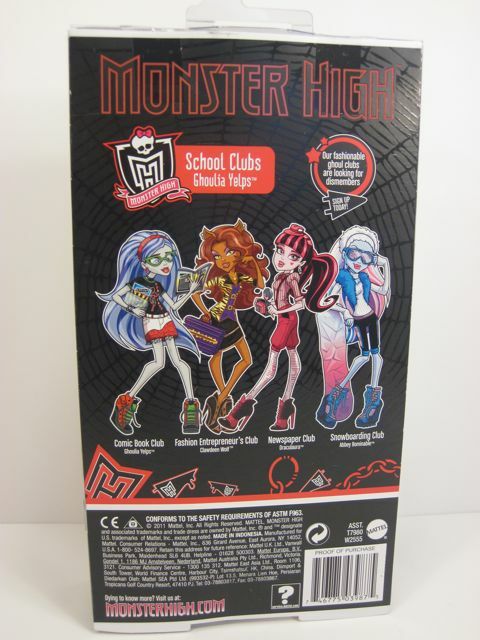 I think the Monster High boxes are part of their appeal. The notebook-shaped window boxes are very colorful and inviting. There's a lot going on inside that box, and you have to peer in there and look around to see all of the things you're getting with the doll. It's pretty fun. 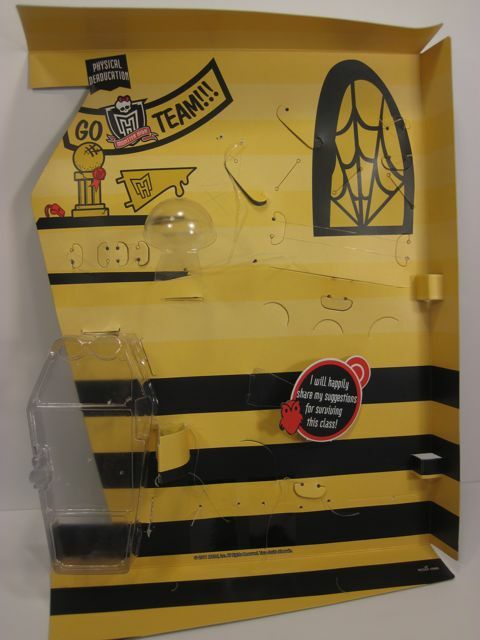 I see a plastic locker, a ball, a cute extra dress--maybe stickers? 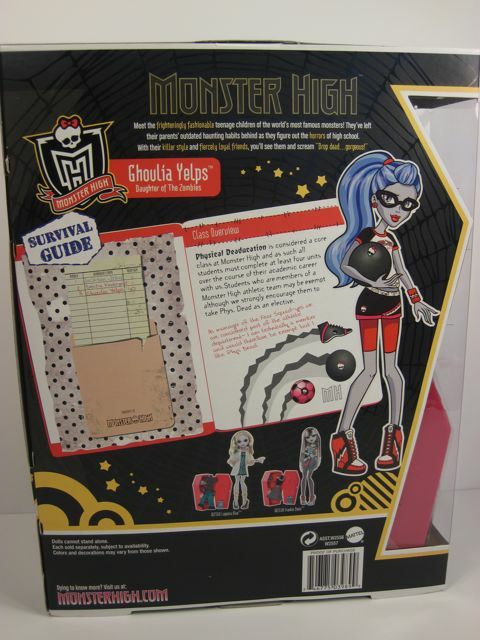 You could spend a while just reading the back of the box and learning a bit about Ghoulia's personality. This is good for me since I don't watch the TV show. Here's her face up close--she is very nicely displayed in there, but I am dreading trying to wrestle her out! 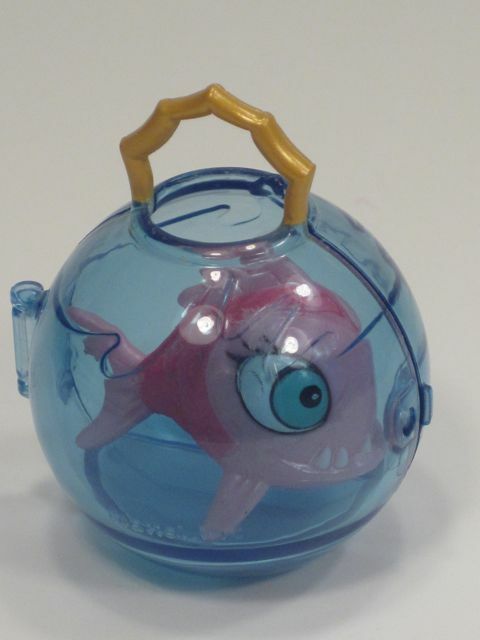 It didn't take too long to get her out--the hardest parts were her head (held in by three tight plastic ties) and the ball, which was encased in plastic. That would've fit in a much smaller box! 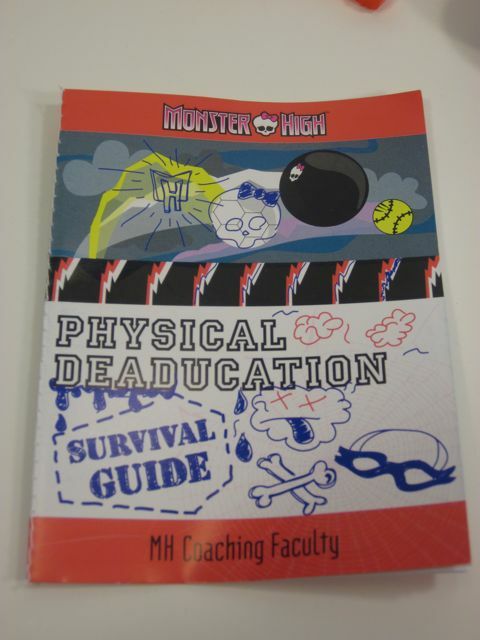 The "Physical Deaducation Survival Guide"
The dress uses three different fabrics! 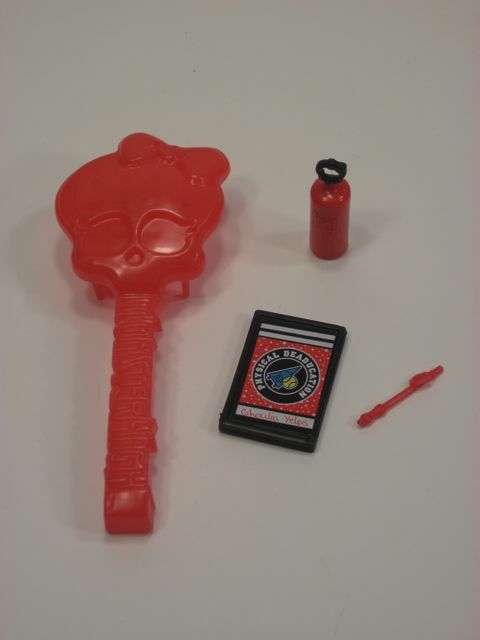 That little skull lock actually opens and closes! I think what happened here is that this doll has loosely-strung hips and the tight elastic of the shorts was able to squeeze into the gaps in those joints and make them open up even more. The only Draculaura I have ever owned also had really loose hips, and I was unable to pose her much at all. Bummer. 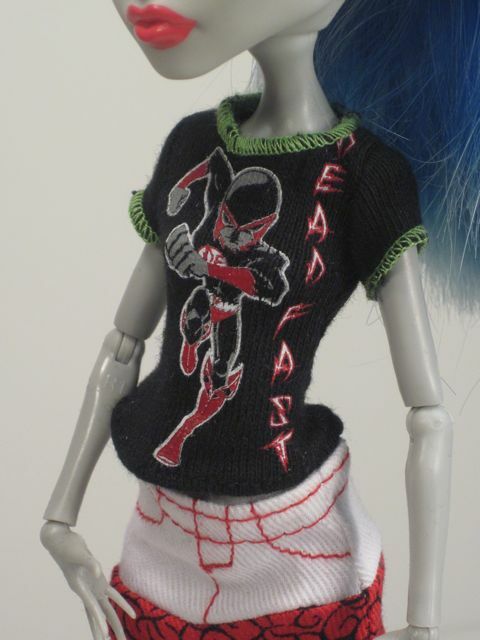 The outfit is great, though, with two complete pairs of shorts and a sporty tee shirt that says, "Monster High, Phys Dead." 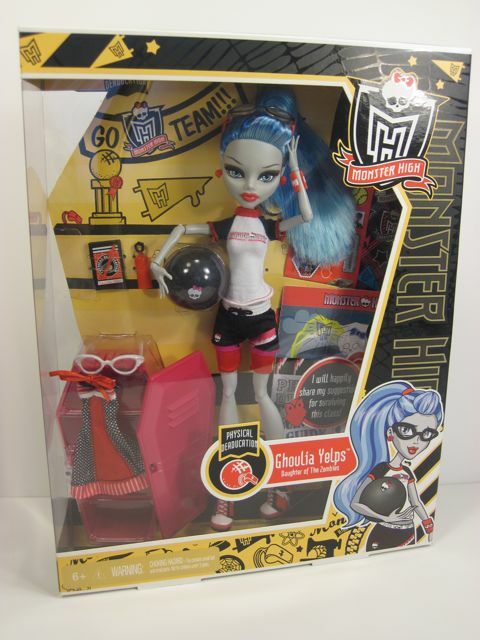 Ghoulia's face is nice, too, with and without her goggles. I love her blue hair, and I love that she wears safety glasses for gym class. 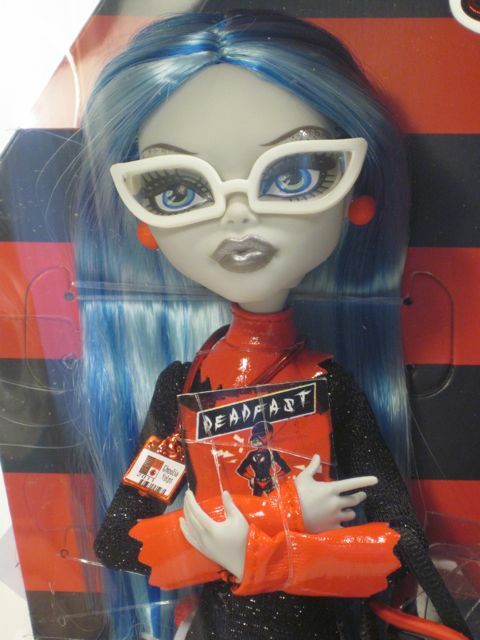 I think I might like "Dead Tired" Ghoulia better with her lighter lips, but I like the original Ghoulia with blood-red lips best of all. I think this girl looks great with red lips because the brighter lip contrasts really well with her hair, and all of her clothing has red in it. I got her out of those pesky shorts and into the extra dress. Very nice! 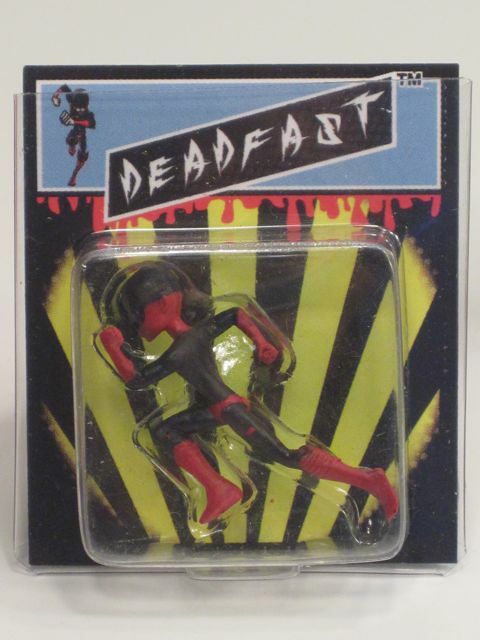 OMG...you got me a Dead Fast action figure?! Eeeeeee! 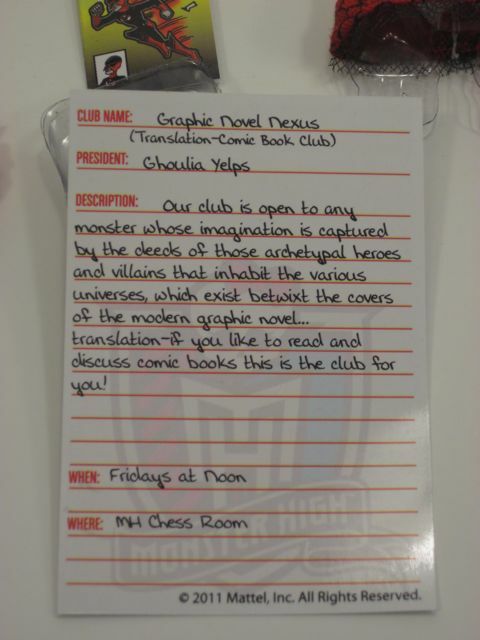 Oh--and this description of the comic book club. The action figure is fantastic! He comes out of the package! It is a fun overall look, I think. My favorites are her green glasses, the brain-patterned skirt (with a tiny net detail on the hem) and the graphic tee. The seams in the back of her legs look like they are split. Not sure if this is going to get worse over time, or if that's just the way it will stay. I often gripe about the decreasing quality of dolls. I do think it is a pervasive problem. 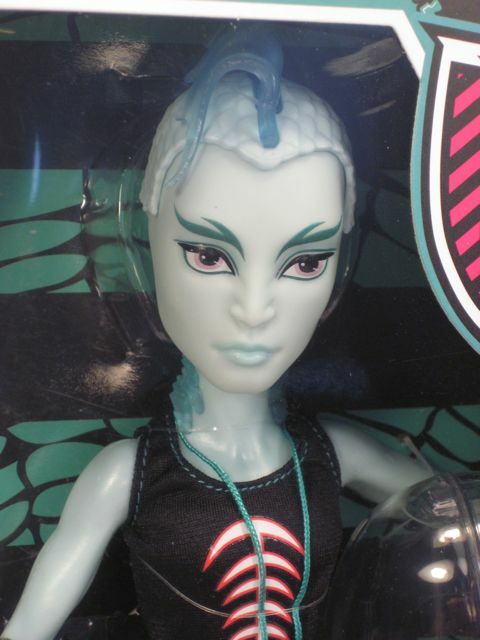 However, I have to give credit to Mattel, because I feel like Monster High dolls, in general, have improved over the last year. 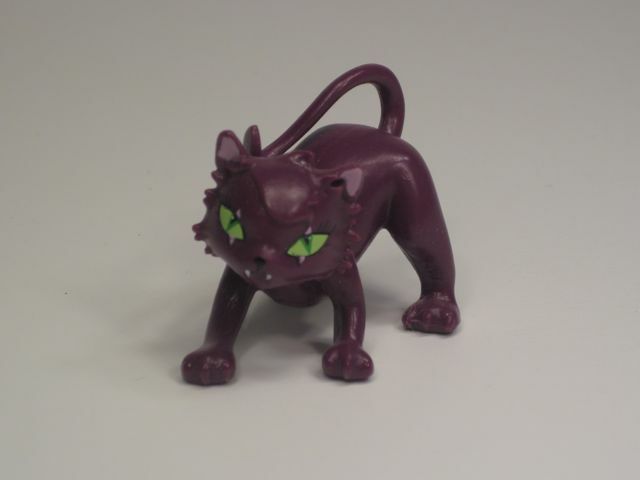 I remember when I was driving back and forth to Toys R Us to seek out a green-haired "Dawn of the Dance" Clawdeen Wolf. After more attempts than I care to admit, I just gave up. I never found one that was free of obvious flaws. The hair was cut badly, the hair was plastered to her face, the face was stained, there was some kind of ick on her clothes, the arms had fallen off...you name it. These days, however, I feel like the majority of the dolls on the shelves look pretty good. 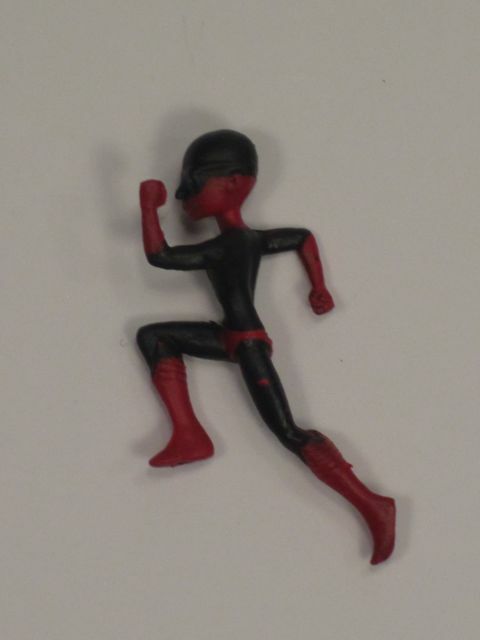 I also think the arms stay on better than they used to, and Mattel keeps changing and improving the body sculpts. Furthermore, each new character that is introduced has its own intriguing features to make it unique. There isn't much recycling of old ideas. From too much salt water? The new Clawdeen, awesome she is, has boots that will not come off. Well, ok, they did eventually come off, but it was really super-hard to get them off. 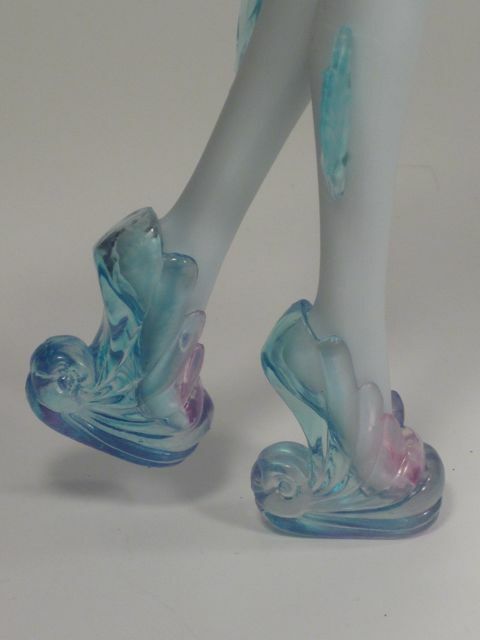 It hurt my fingers, and one of the heels came loose during the battle and will need to be re-glued. black ribbon thong-type thing. Eeew. However, for every bad thing about these dolls I can name six good things. First of all, the shoes. Oh, my goodness, the shoes! 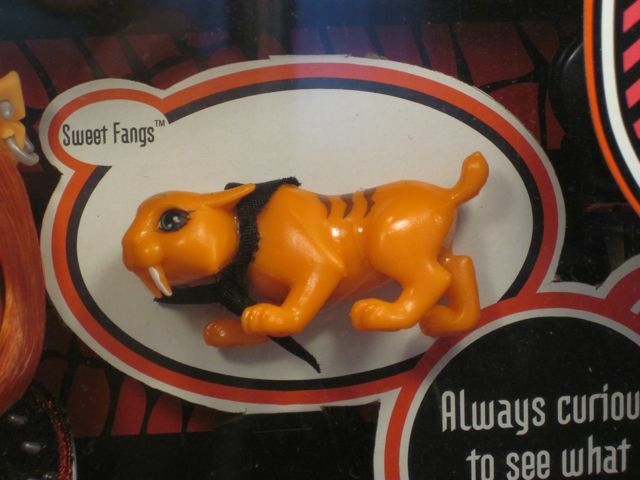 "Sweet Fangs," Toralei's saber-toothed tiger. 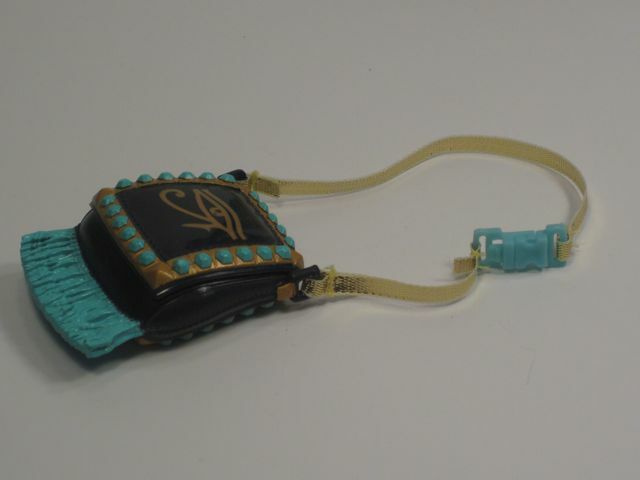 Look at that nifty little clasp...that actually works! 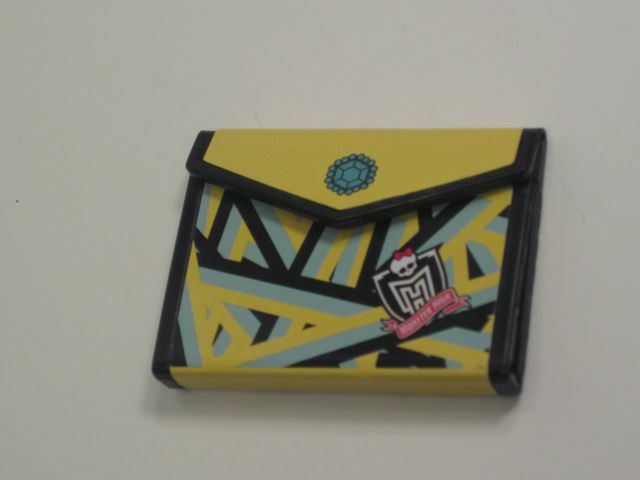 I even love the smaller accessories like Lagoona's sweet seahorse necklace and Clawdeen's spiked brass knuckles. "Skull Shores" Abbey's full-spectrum hair. "Dawn of the Dance" Frankie's salt and pepper mix. Bottom line? The dolls have their flaws. While quality control seems to have improved a bit, there are still dolls on the shelves with poor stringing, facial marks and seriously wonky eyes. I am very sympathetic to kids who save up for the doll of their dreams and end up getting a dud. Another thing is that some of the clothing choices on these dolls cross the line in terms of appropriateness for younger kids. 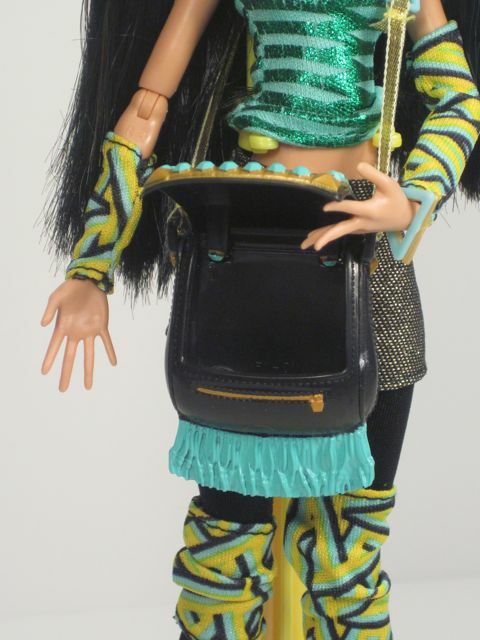 I do not like a doll who has a thong, or who can't sit because her skirt rides up and exposes her underwear. 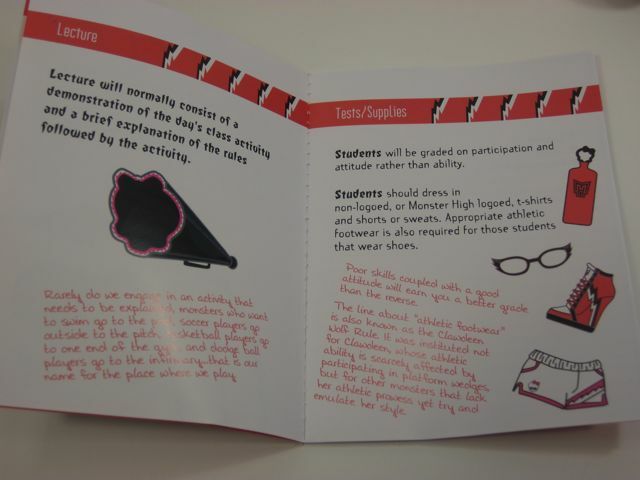 Last, as visually appealing as it is, the packaging contains a lot of waste. The dolls are a slender 11 inches tall and yet the boxes are 10"x13". 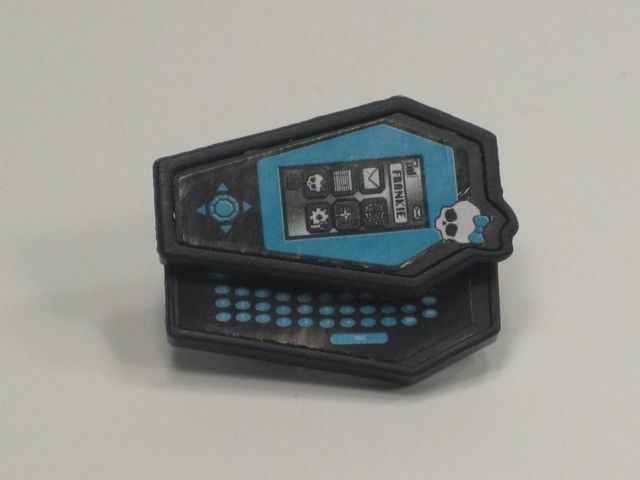 Pretty much all of the accessories are made out of plastic. 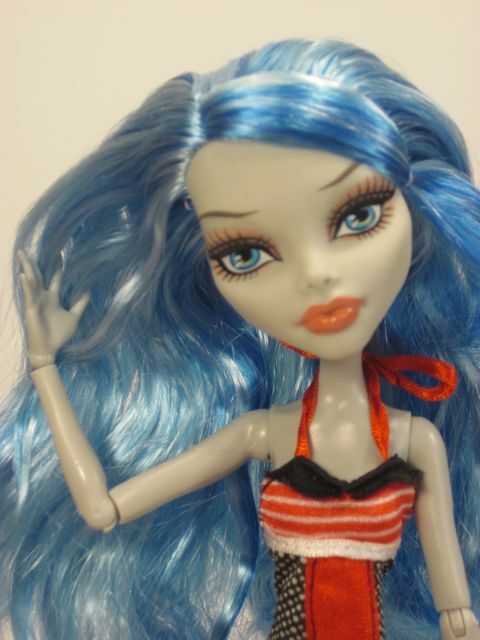 However, these dolls have so many interesting and appealing qualities that the good overshadows the bad. There is a huge diversity of characters in this line, and each new character that is introduced has the same level of individuality and attention to detail as the original five. The fashions are fabulous and edgy, and the design team that makes the shoes is genius. The face paint is quite beautiful and is getting better. The accessories, while all plastic, are well conceived and well executed, down to the tiniest earring. The body shape of the girl dolls is fascinatingly unusual. 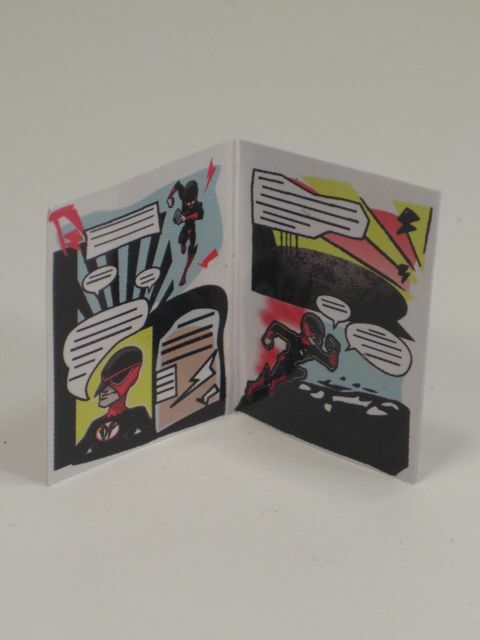 The splayed-finger hands and cartoonish features are appealing and expressive. There is a huge variety of skin color and appearance. More than anything else, though, it is the seemingly endless creativity of this line that keeps me coming back for more. Wolf ears, transparent limbs, skeleton faces, dragon wings, extra eyes...what on earth will they do next? I can't wait to see. Box says 6 and up, I would evaluate outfits individually when shopping for a younger child. You get a lot for your money with most dolls. Variable. Great attention to design details. Quality control fairly good, but still some serious flaws in a few of the dolls. Lots of plastic. There is a lot of extra stuff cluttering the boxes. Makes them visually very appealing, but there’s a fair amount of garbage. Yes. Because of their mass appeal and scarcity, some of these dolls have significantly increased in value. These are character dolls, for sure, but you don’t need to watch the show to enjoy their diverse personalities. The creativity in the dolls' design is very inspiring and the fantastical themes will surely open a child's imagination. I have the same doll! 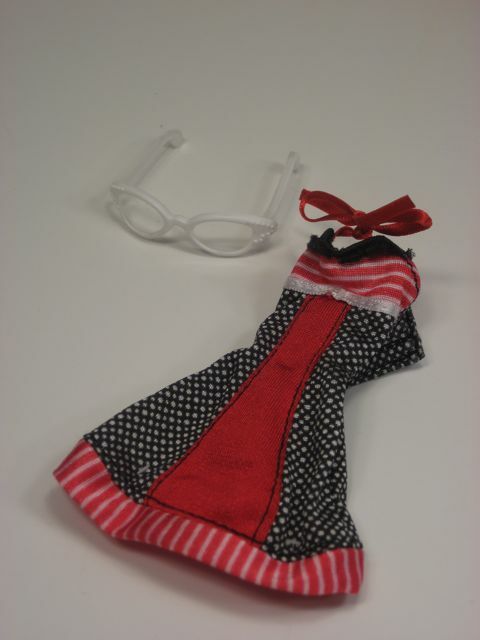 Bought her especially for the glasses, because they are awesome! (And I needed an extra doll for clothing fitting etc). 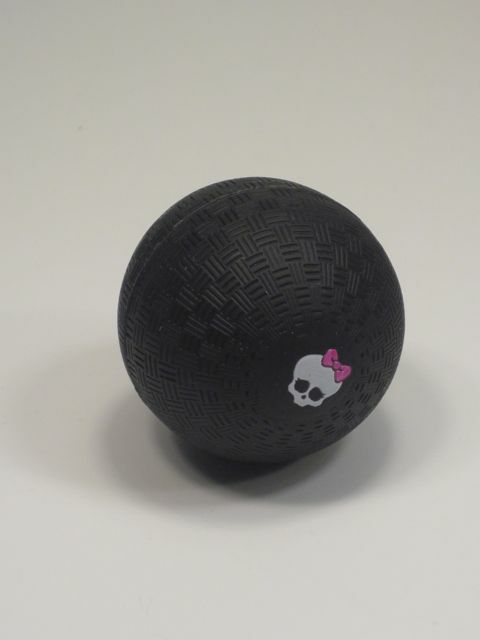 I really had to laugh at the "It doesn't bounce." comment underneath the picture, because that was actually the FIRST thing I tried out with mine! And no... it doesn't bounce... My floor felt it! oooops! Ahhh does wonky eyes! You can try to give her a repaint! 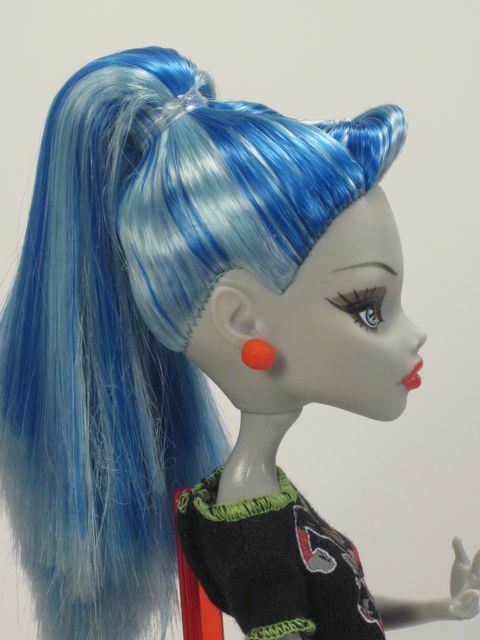 Some artists can do amazing things with a Monster High doll! 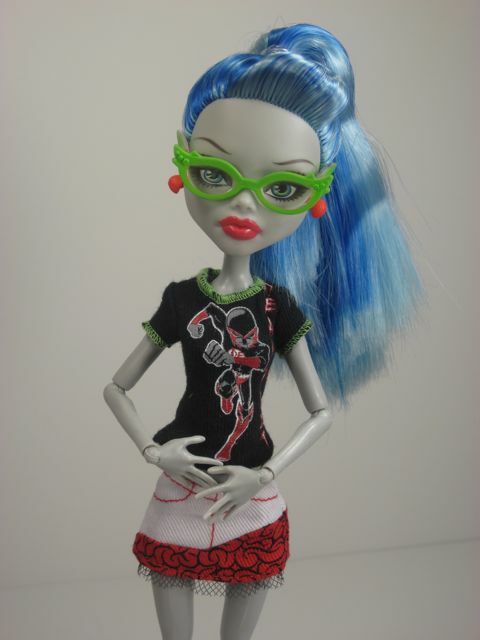 You make clothes for Monster High? Cool. 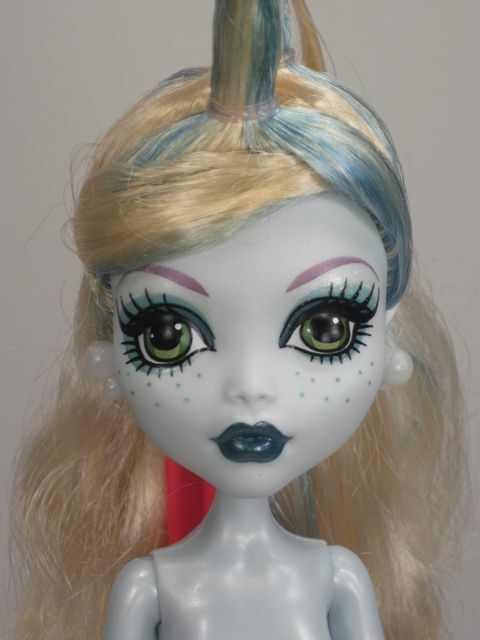 I should get Lagoona repainted, because I like the shape of her face so much. I am tempted by Freddy Tan's repaints on eBay--have you seen those? They are AMAZING!!! 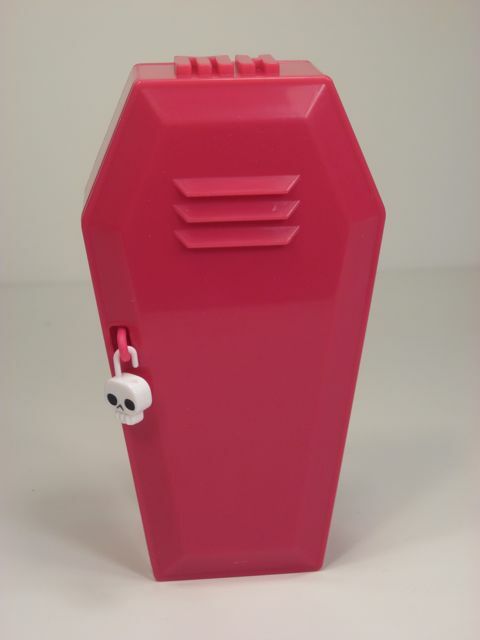 So Mattel finally figured out how to make money on today's tweens and teens who consider Barbie a babyish toy. I don't personally know any girls in the target demographic but it seems these MH dolls are considered cool (for now -- fickle youth!) so friends won't make fun of the dolls, which is a HUGE deal to most teens. 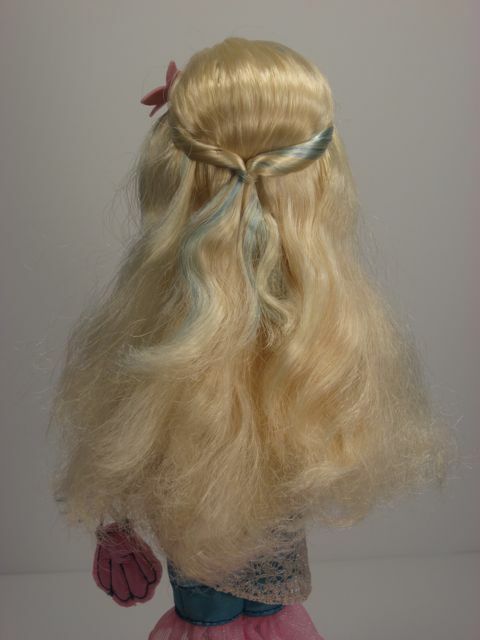 I'm also reminded of the Oldsmobile commercials: "This is not your mother's Barbie doll." Mattel hit it out of the park with this line. I like how they went all out with the monster theme instead of playing it safe with a bunch of vampire friendzzz to tie in with the Twilight craze. The dolls are so different and just plain weird but they still manage to be cute and fun with a positive message. Their sense of humor is refreshing too. Kudos to the design team for sure, but also to Mattel for taking a chance on something so off-the-wall and way different than Barbie and fairy princess unicorns. Now that MH is a big hit it might seem like an obvious winner, but they really did risk a lot of money on something totally new for girls. I love her!!! I am sure she is gone by now but I would have loved to have her!! 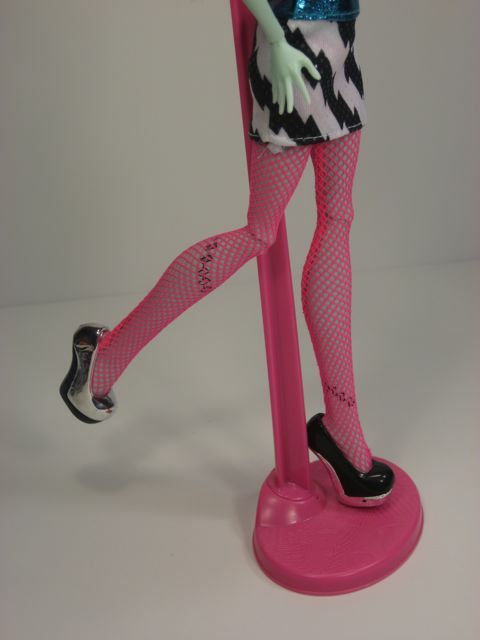 i found a way to tighten the lose hip joints on a couple of my monster high dolls, basically just bend the leg out and up ( like a high kick ) and wind it until its nice and tight, hope that makes sense! If u ever get some mest up mh doll, wonky eyes. broken legs,etc. u could call mattel for it. i did 2 times cause of bad arm, and the other had really bad paint job and bad hair. Really? That's great! They send you a replacement doll? Yep, no problems at all! I had a gloom beach clawdeen and a opertta replaced. they are super nice about it. all they need is a adress and your phone and email. than the number in the back. This is VERY informative indeed, thanks so much for this!! I've have been hunting online stores for a Wave 1 Clawdeen bcoz' it's sold out in most countries and it hasn't even reached here in our country. T_T only the 2nd wave is out, but of course as a fan, you'd want the original doll first perhaps. 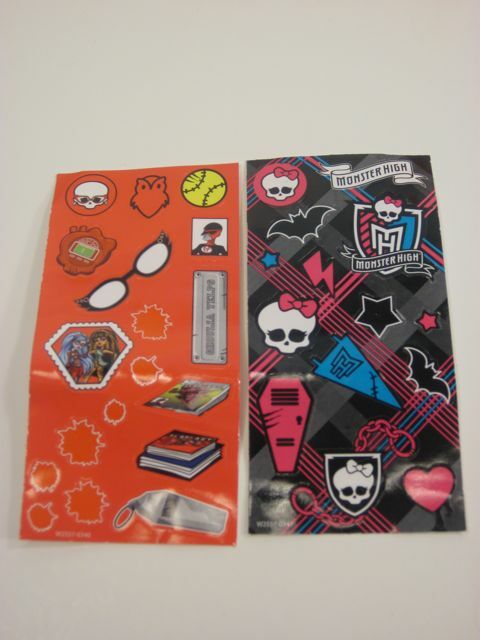 Thanks for your enjoyable blog post about the Monster High collection. It's truly informative for an MH newbie like myself. 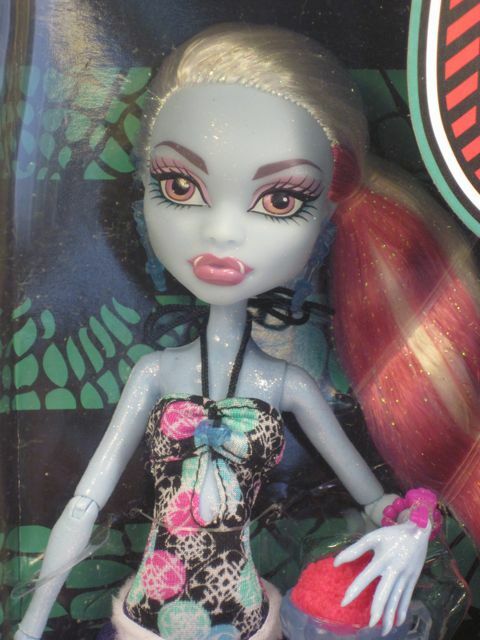 I just bought my first Monster High dolls today, after debating for weeks whether I was too old for them or not. I bought the Fearleading Squad 3-pack. 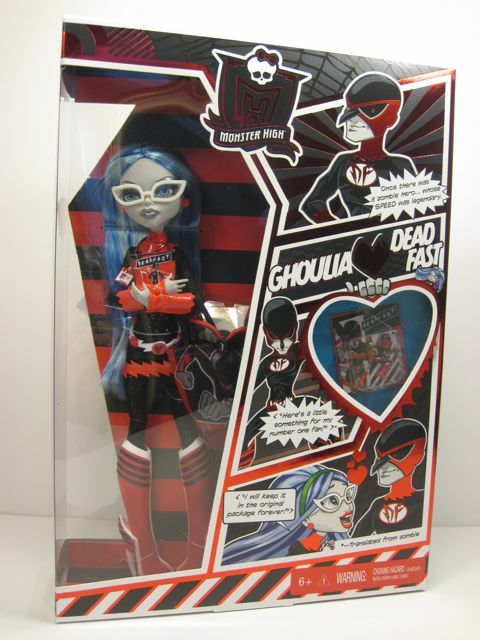 Ghoulia is my favorite, but I couldn't find an individual one that I liked. I like her best with long straight hair and glasses, and the only individual ones I could find were the roller derby, where her hair is in curled pigtails and she has safety goggles on, or the Skull Shores, where her hair is curly and she's wearing sunglasses. 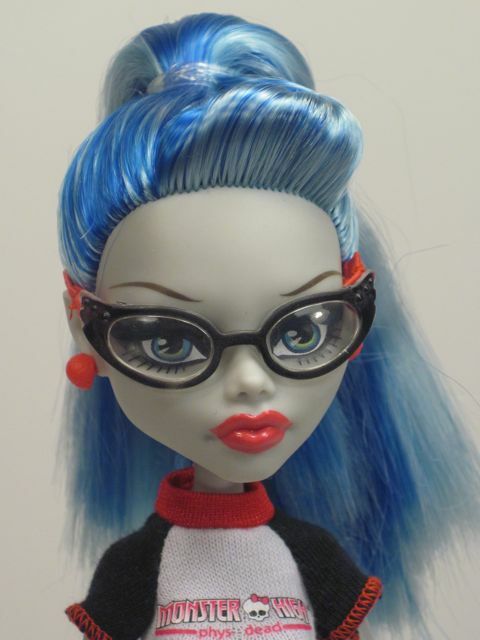 I like the cats-eyes-glasses "nerd girl" look the best, and the Ghoulia 1st Wave is impossible to find at or near retail price. I can't wait to get home and take them out of the box. I know there will be more MH purchases in my future. Right so I just typed up five paragraphs of a very articulate reply for this amazing review you've made and Livejournal decided to eat it, so in sum: I love everything you've written here, 10x props for going into such careful detail and including awesome photos, and by the way have you noticed/heard of the 'glue problem' that widely afflicts Monster High dolls - more info on such can be found here (Facebook) and here (Change.org). Basically, the glue is found within the heads of all Indonesia-made dolls and isn't the same as the styling gel they use on some, notably Dawn of the Dance Clawdeen and Toralei as that's easy enough to wash out. 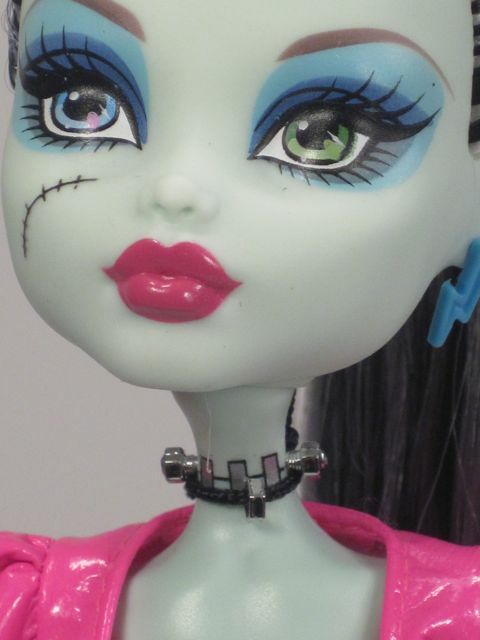 The glue is a different substance found within the head, supposedly used to 'secure the hair' but appears to be an attempt to make the manufacturing of Monster High a more expedient process. After a few months it often leaks out and leaves a bedraggled and greasy appearance to the hair as well as a pine-like odor. 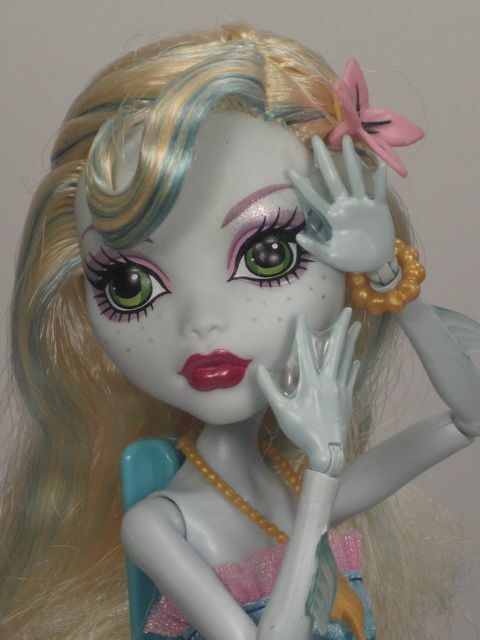 Wow you actually have Basic Lagoona?? 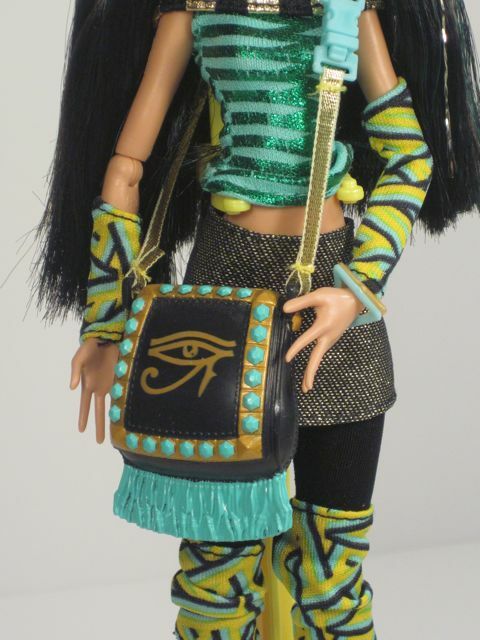 Oh my god I've looked on Ebay for her, but to no avail... She appears very rarely on Amazon but there, she costs from $60-$90 :( Frankie Dawn Of The Dance is another doll I would've happily taken home from the stores with me. 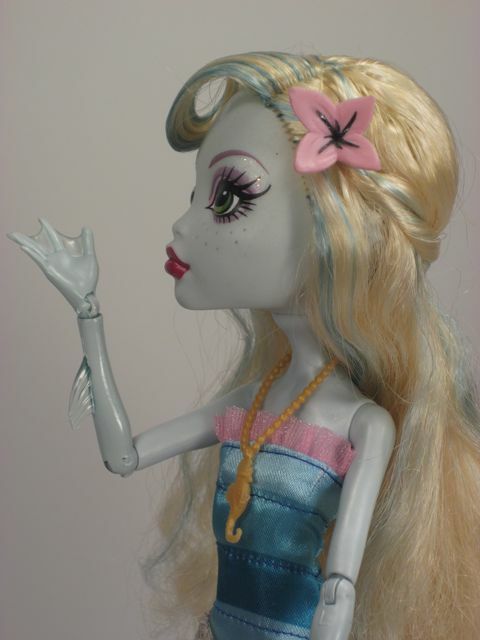 which lagoona do you have? 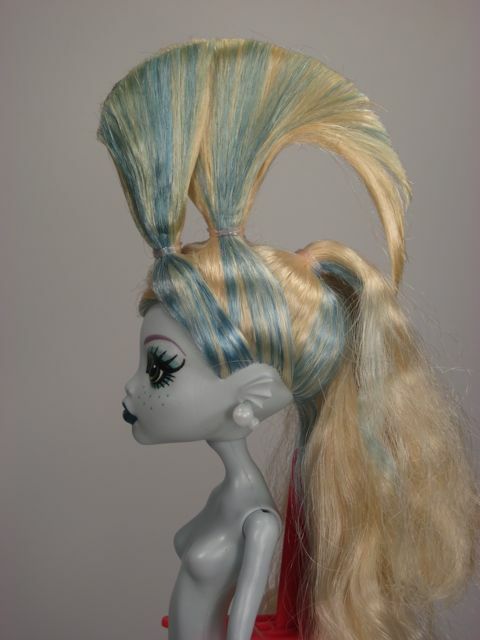 i have the original wave one basic lagoona, from a few years ago. 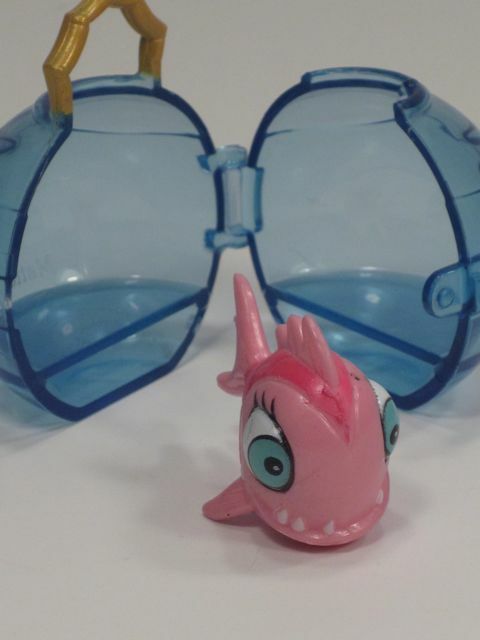 the dress on yours looks different (mine has a pink swimsuit with tights, shorts, and a hoodie) however they have the same face mold, necklace, bracelet, hair clip, and pet. the curl in the hair looks strangely different as well, but i've washed mine over and over again, so that particular section of hair has settled down and become mostly straight. 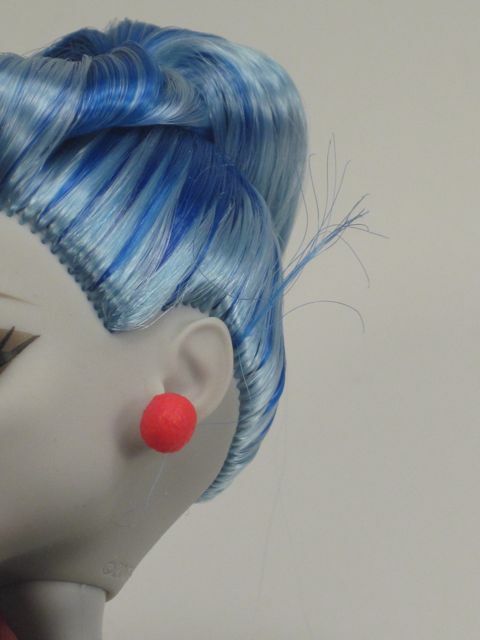 Do you know if the Monster dolls and Barbie's heads are made of the same materials? 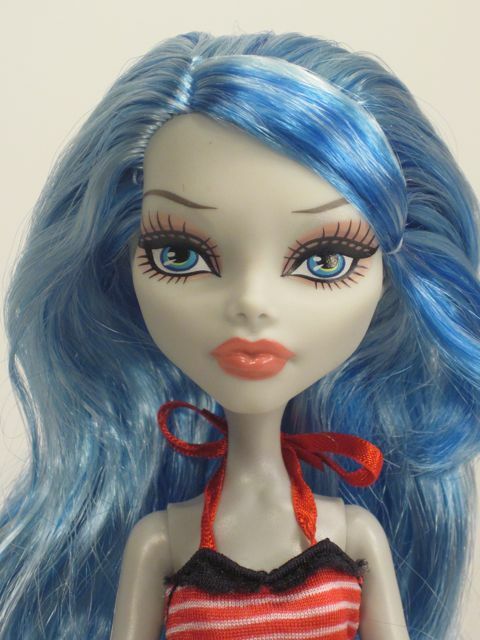 I've seen a lot of 'face ups" on youtube where the artists repaint monster high dolls and was wondering if the same techniques could be used for Barbies (ie. watercolor pencils, pastels, and sealant).